For anyone who is an avid sports fan, this is a great time of year. The baseball pennant races are full-bore, the college football season has kicked off and the 94th season of the National Football League (NFL) begins on Thursday night, September 5, 2013. Six months later, on February 2, 2014, the NFL season will end with the crowning of a champion team of Super Bowl XLVIII. Between now and February, a curious addiction will befall many otherwise sane men and women who enjoy following professional football. They will be consumed with the stats of players who most likely don’t even play for their favorite teams. They will spend many hours studying obscure facts such as how well a given running back performs on artificial turf versus real grass. They will struggle to juggle all-star lineups to best take advantage of a scoring system that approaches the complexity of the U.S. Tax Code. Unlike the treatment delivered by the specialists at Texas Back Institute to patients with back pain, herniated discs or other back problems, there is really no cure for this football sickness. 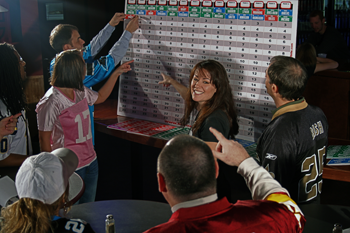 These lost souls are smitten by the phenomenon of playing fantasy football! It may not surprise you to learn fantasy football is a very big business. It is estimated by the Fantasy Sports Trade Association that 32 million people, aged twelve and older in the U.S. and Canada, play fantasy sports. The trade group notes that fantasy football players make up 90% of the fantasy sports “industry.” This participation has grown by over 60% the last four years with 19% of males in the U.S. playing fantasy sports. Because of this high level of participation many consumer products companies such as Sprint, Yahoo, ESPN, Fox and others have invested millions of dollars in fantasy football services and promotions. The two groups who usually disagree about almost everything associated with professional football – NFL properties (composed of the team owners) and NFL Players (the players’ union) – have both created products and services that encourage fans to play fantasy football. Most of the fun of playing fantasy football involves choosing a “dream team” from a group of outstanding players. There are no bad football players in the NFL. They’re all good. Therefore, getting to choose the best of the best for one’s own team can be great fun. In a similar fashion, the spine specialists at Texas Back Institute are the best in their class and as such, there are only great choices. In celebration of the hundreds of thousands of fantasy drafts in full-swing at this moment, we thought we’d introduce you to our dream team. 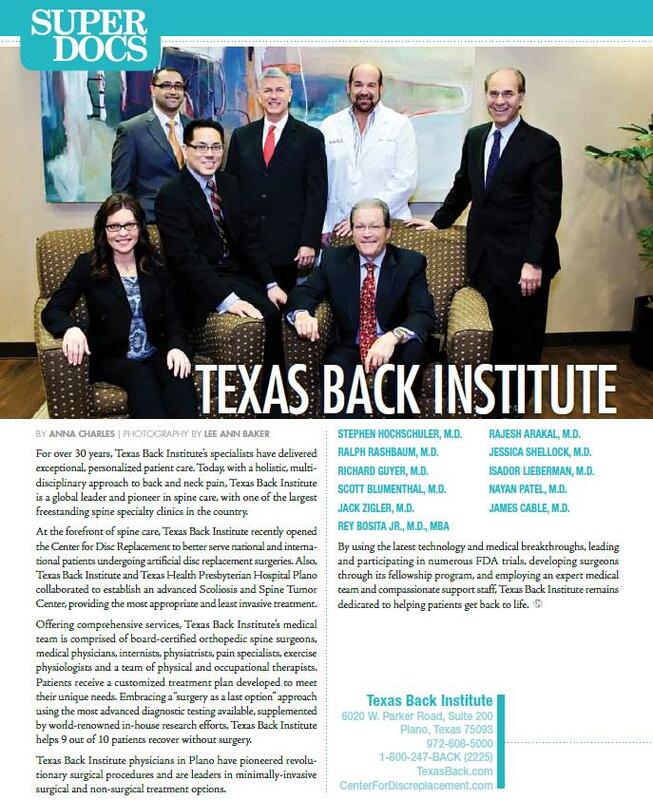 Texas Back Institute was formed in 1977 by Stephen Hochschuler, M.D., Ralph Rashbaum, M.D. and Richard Guyer, M.D. The organization is internationally recognized for excellence for spine injuries. In football terms, this team plays offense and defense equally well and the patients are the big winners. 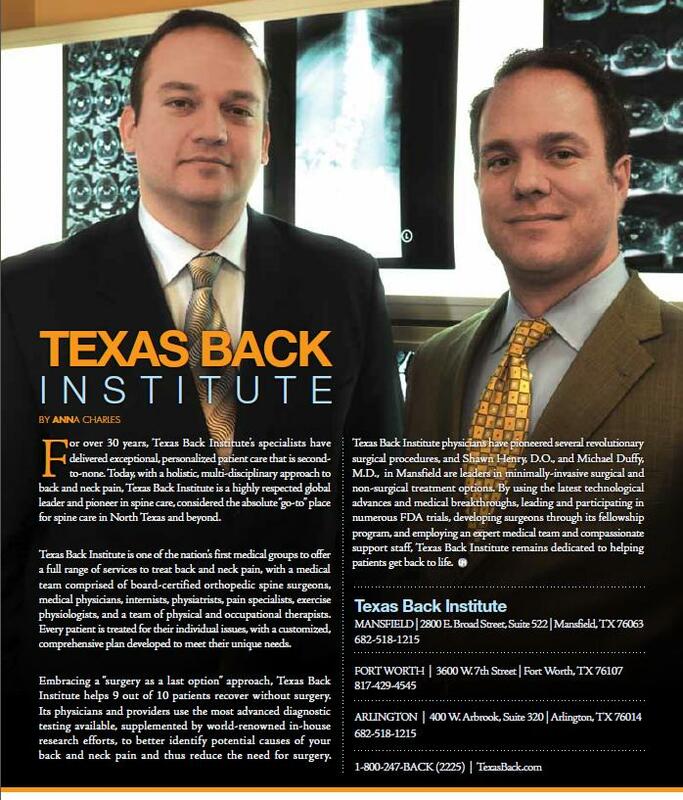 As with NFL teams, the Texas Back Institute team is composed of the best of the best of spine surgery, research and therapy. The game plan for our team has been consistent for more than 35 years. Each patient injury or condition is unique and is best treated with the most minimally invasive approach. Here’s a brief “draft” report on each of the Texas Back Institute physicians. Add Dr. Arakal and other TBI surgeons to your team if you need thorough evaluation and treatment of cervical, thoracic and lumbar pathology. Add Dr. Belanger and other TBI back experts to your team if you want a spine specialist who evaluates each patient and their situation carefully and makes treatment recommendations based on their goals. Andrew R. Block, Ph.D., A.B.P.P. Add Dr. Block to your team if you need to overcome emotional difficulties of surgery, deal with stress and control medications to achieve the best surgical outcomes. Add Dr. Blumenthal and other TBI back specialists to your team if you believe the goal of a spine surgeon is to get his patients back to life using the most advanced motion-preserving technologies, including lumbar and cervical artificial discs as well as posterior dynamic stabilization. Add Dr. Bosita and other TBI physicians to your team if you want to be treated with respect and have your fears about neck and back pain removed. Dr. Bradley along with every other TBI specialist should be on your team if you feel treatment should use the latest in motion preservation and minimally invasive surgical techniques. Add Dr. Cable to your team for occupational and sports medicine issues. He knows wear and tear eventually affect all of us but most back pain is manageable with proper care. Add Dr. Duffy to your team if you agree that we should get busy living! His goal and that of the other spine specialists at TBI is to deliver effective spinal care to patients in order for them to return to doing what it is that makes them happy. Add Dr. Gibbs to your team if being in pain affects many aspects of your life. As a physiatrist she works hard to provide patients with the best comprehensive non-surgical care. As one of the founding physicians of Texas Back Institute, Dr. Guyer is both a player and a coach for new team members. Add him to your team if you agree with his “family test” philosophy – treating patients the way he would want his family members to be treated. Dr. Henry and the other spine specialists at TBI should be on your team if you want to be treated with the most advanced technology and treatment available for your condition; holding surgery as a last resort. Add Dr. Hisey to your team if you feel the goal of neck and back treatment is to return patients to productive and pain-free activity using the most advanced minimally invasive and motion-preserving techniques. 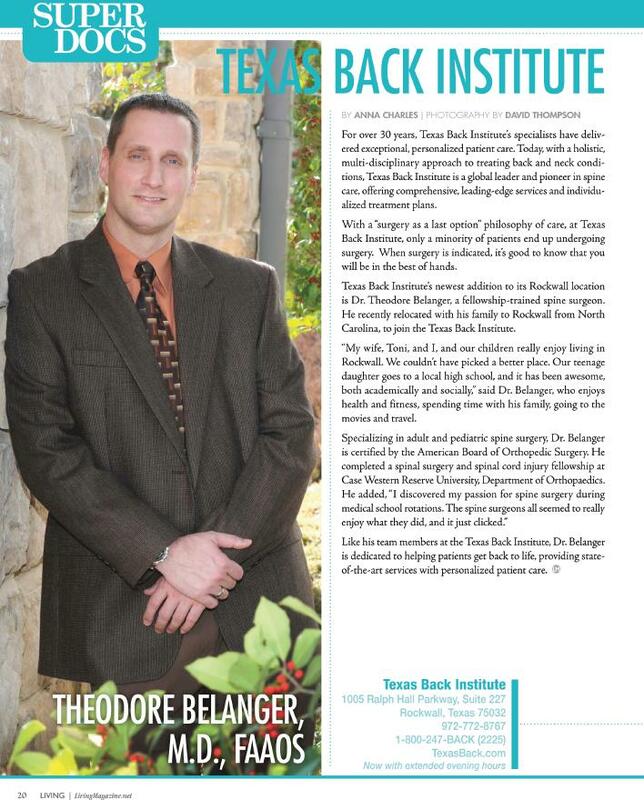 Add Dr. Hochschuler and the other spine surgeons at Texas Back Institute to your team if you have lumbar spinal problems or have had a failed spinal procedure. Add Dr. Jehan and the other specialists at TBI to your team if you feel the goal should be to help treat not only back and neck issues but also to provide effective coordinated support to help patients get through every day of life without any stresses related to their condition. If you want to be treated with respect, compassion, add Dr. Lankford and every other physician at TBI to your team. He can help you understand how pain affects your everyday life in order to help you get back to life. Add Dr. Lieberman and the other spine surgery experts at TBI to you team if you want to be treated as if you were the only patient we have. If you believe in ethical treatment and the importance of educating patients regarding all available treatment options, you should consider adding Dr. Marchetti and the other spine specialists at TBI to your team. Add Dr. Patel to you team if you think patients should be treated in the same way a physician treats his own family. Add Dr. Rashbaum and the other spine surgery specialists at TBI to your team if you want a timely response to back conditions which leads to predictable outcomes. Add Dr. Shellock to you team if you think it’s time to take your life back, with minimally invasive treatment. Along with the other experts on the TBI team, she is highly trained in the latest procedures. If you want a doctor who sees surgery as a last resort and is dedicated to returning you to the lifestyle you had before the back pain, you want Dr. Tolhurst on your team. Add Dr. Zigler and the other spine surgeons at TBI to your team if think surgery should be the last resort. However, if it’s required, he’s one of the best spine surgeons in the U.S. There are literally hundreds of ways to set up your league and arrange for a draft of NFL players. The best advice for those new to this pastime is to understand how the players’ performance will be scored each week. This will help determine the number of running backs, wide receivers, tight ends to choose. For example, in some leagues, the yardage gained by running backs is weighted higher than the passing yardage of quarterbacks. One should also be aware of the “bye” weeks each team has (when they are not playing) because this will mean a player on the team with the bye, will not play that week and should not be in the lineup. Here’s a good primer on choosing your fantasy team. Fortunately, choosing a spine specialist is much easier than choosing a fantasy football team! 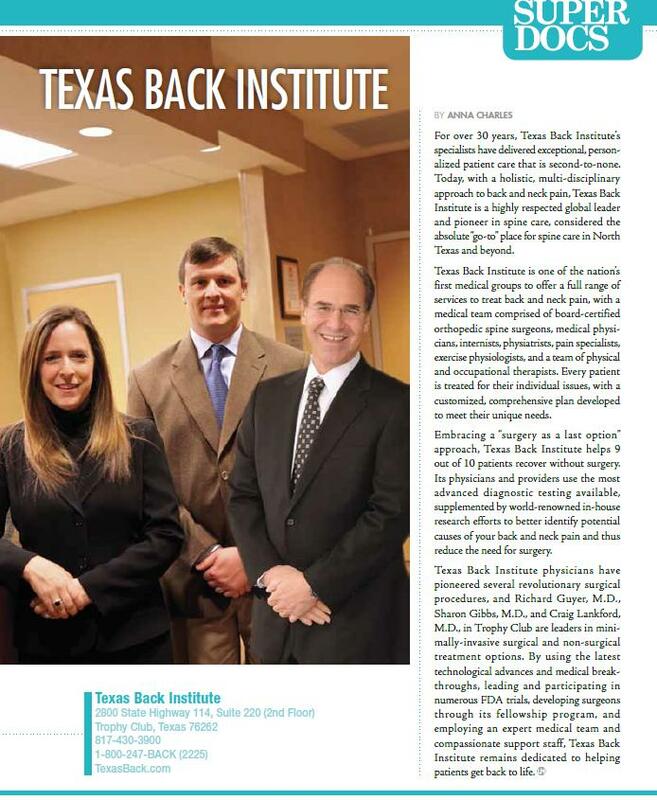 With more than 35 years of excellence in spine treatments, management of many FDA trials and a foundation of minimally invasive treatment, the dream team of physicians at Texas Back Institute is championship caliber. Living magazine recently did a feature in their March issue showcasing “Super Docs” throughout the community. Well guess who made it on the list….Texas Back Institute. Congratulations on being “SUPER“! We know finding a spine specialist can be a complex process and our goal is to make it as easy as possible. With 20 physicians and 14 convenient locations throughout the metroplex – let us help you get back to life! Where have all the super heros gone? Check out our new radio commercial. What do you think? 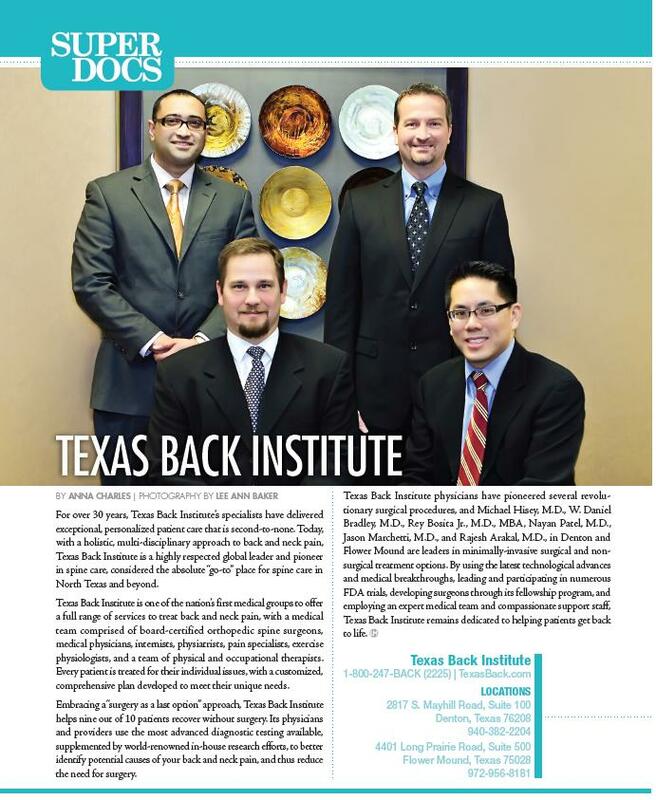 Did you know Texas Back Institute has trained over 90 spine surgeons now practicing in the US? Did you know TBI surgeons performed the first artificial disc replacement, have written over 200 articles for scientific journals and have pioneered numerous minimally invasive surgical techniques? Sounds like the work of Super Heroes to me!